All Visual LANSA systems are shipped with a utility named RUNSQL. RUNSQL can be used to automatically create the definition of a table into any supported DBMS system. RUNSQL, combined with a .CTD (Common Table Definition File) file created by Visual LANSA during table compilation, form the essential ingredients that you need to move table definitions (not data) between different supported DBMS systems. When the RUNSQL utility is invoked it reads in the file named PSLMST.CTD. This is the "Common Table Definition" (CTD) of table PSLMST that is created by Visual LANSA whenever you compile a table in your development environment. 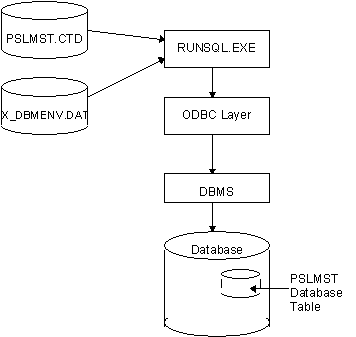 It defines table PSLMST and its associated views and indices in a common cross platform / cross DBMS format. RUNSQL also reads in a standard Visual LANSA file named X_DBMENV.DAT (Database Environment Definitions) that defines the unique characteristics of the DBMS that it is about to work with. By using PSLMST.CTD and X_DBMENV.DAT the RUNSQL utility can assemble the unique "create" commands appropriate for the selected DBMS. Once the "create" commands are assembled the DBMS is invoked (via ODBC in Windows environments) and it is asked to create the necessary table, view, indices, etc. The (qualified) name of the .ctd (Common Table Definition) file that contains the definition of the table to be created. Common Table Definition files are created whenever you create a table in your Windows development environment. The.ctd files can be found in the X_LANSA\X_ppp\SOURCE directory (where "ppp" is the partition identifier). The name of the database or data source that the table is to be created into. Commitment Option. Must be Y or N and indicates whether a commit operation is to be issued after the table has been successfully created. You should always set this parameter to Y. Reporting Option. Must be Y, N or F to indicate the level of reporting that RUNSQL should use. Y = Report on all messages and warnings. N = Do not report any messages or warnings. F = Report on fatal messages only. The type of database. This value is used to locate the database characteristics in the X_DBMENV.DAT file in ...\x_win95\x_lansa. The User ID/Password to be used when attempting to connect to the specified database or data source. This parameter is required even when using a Trusted Connection. New Collection Name. Specify *DEFAULT to ignore this parameter. Must be Y if the connection information contained in the .ctd file is to be used. Only Imported tables will have connection data in the .ctd file. N or blank if not used. Prompt User ID/ Password option. Is Y if the User ID and Password in the .ctd file is to be used. Old .ctd file name. This is the .ctd file that was last used to create/change the table. The new and the old CTD are compared and any changes or new columns are added to the table without deleting the existing data. Note that non-positional parameters can be placed anywhere on the command line separated by spaces from the other arguments. Runsql "…\myfile.ctd" LX_LANSA Y Y MSSQLS uid/pswd "…\x_win95\x_lansa"